Start off your visit on the 26th (Fri): get a sense of history and politics at Palazzo Pubblico. 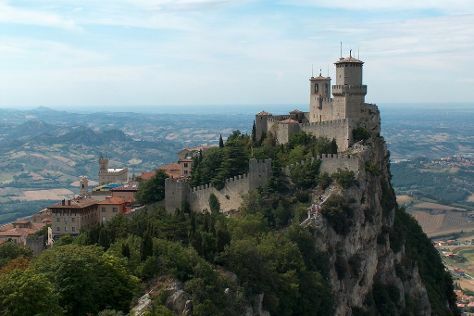 On the 27th (Sat), you'll have a packed day of sightseeing: look for gifts at La Saponeria Del Titano, then step into the grandiose world of Guaita, then take your sightseeing to a higher altitude at Mount Titan, and finally stroll through San Marino Nature Park. You can plan City of San Marino trip in no time by asking Inspirock to help create your itinerary. London, UK to City of San Marino is an approximately 6.5-hour combination of flight and bus. You can also do a combination of flight, train, and bus; or do a combination of car and ferry. You'll lose 1 hour traveling from London to City of San Marino due to the time zone difference. Expect somewhat warmer temperatures when traveling from London in April; daily highs in City of San Marino reach 19°C and lows reach 10°C. Finish your sightseeing early on the 28th (Sun) so you can travel back home.